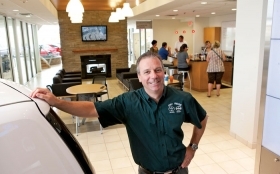 At Rob Marshall's Toyota store in northern Kentucky, customers can relax by the stone fireplace or hunker down to a buttermilk waffle in the cafe. Many walls are glass, so people can watch their cars being serviced. The past few years produced a few hiccups for Rob Marshall, a northern Kentucky auto dealer accustomed to steady sales and showroom traffic. His Chrysler-Dodge-Jeep-Ram dealership along Interstate 75 south of Cincinnati survived Chrysler's 2009 bankruptcy. Marshall's Toyota store, just down the interstate in Dry Ridge, weathered the automaker's recall crisis. But like many dealers, Marshall has battled the occasional crisis of confidence during the industry's meltdown. When new domestic franchise opportunities arose in recent years -- some "for nothing," he says -- the second-generation dealer was too spooked about the future of Detroit's automakers to jump in. Through it all, he kept an eye on the future -- fortitude that paid off with the late-August opening of a $6 million, 35,000-square-foot Toyota-Scion store. It's nearly twice the size of his former Toyota store across the street, and it's not your ordinary dealership. There is now room for more than 300 vehicles, addressing a top customer concern. A 2007 study by J.D. Power and Associates found that the No. 1 problem customers had with his store was the limited selection of cars and light trucks. Beyond the bright showroom with 16 skylights, there's a customer lounge with stone fireplace, an exercise room, a small fish pond with waterfall and "Lori's Cafe." The 44-year old dealer knows his customers in this conservative rural farm community. And it shows in every detail. Many departments and offices are enclosed in glass to allow customers to see their vehicle while it is being serviced or detailed. During the planning phase, the lounge was doubled in size after customers, in an informal "nitpick session" with Marshall, said they wanted a larger waiting area. "The typical customer here is fiercely independent and doesn't like to be kept behind a wall," Marshall says. A church, a quilting club, the fire department and the local newspaper plan to use the community room when it's not used for staff training. On a recent Friday, the cafe menu featured buttermilk waffles; gourmet oatmeal topped with homemade whipped cream and pecans; ham and cheese hoagies; and apple dumplings. "It smells like home cooking in here every day," Marshall says. The heartbeat of the dealership is an Internet business development center that Dry Ridge Toyota uses to cast a wide net for sales. Up to half of the dealership's sales leads are generated online. It's not unusual to sell a new or used car to a customer in Florida, one of the Carolinas or Indiana. The center is also responsible for follow-up contact with customers -- service reminders, birthday wishes, etc. Toyota's nearby Georgetown, Ky., assembly complex and its work force of about 7,000 employees help generate an additional 10 to 15 percent of the store's annual sales. Marshall's Toyota new-vehicle volume is up by a third to 700 this year; used-vehicle sales have reached 1,000. At his Chrysler store, new-vehicle sales are off 8 percent. Still, the Chrysler-Dodge-Jeep-Ram store in Crittenden, Ky., was expanded this year at a cost of about $600,000 to enhance service and used-car sales. "For every car we are supposed to sell, we move about five," Marshall says. Like most carmakers, Toyota sets a sales target for each dealer based on vehicles sold in each segment, state sales trends, vehicle registrations and other factors. But like many dealers, Marshall is waiting for the election cycle to end and consumer sentiment to change. "Everyone is aggravated right now," he says. "There are no impulse buyers in the market right now -- consumers are focused on needs rather than wants. So we have to expand the sales theater." Chrysler has told Marshall and other dealers it is forecasting a 66 percent gain in Chrysler Group sales throughout his sales region next year. Managing, motivating and training people have been the cornerstone of his success, Marshall says. There's the core sales staff -- people who have been around for years. He avoids hiring associates with automotive sales experience, so training is essential. The sales staff meets every morning to review processes. "Our new hires don't come in with a bad cancer from another dealership," Marshall says. "With our daily training, after 33 days they learn the right processes -- how to greet and treat, qualify their needs and wants, walk around the product and follow up." Teamwork is a hallmark, too. It's not uncommon for a salesperson to retrieve keys for a colleague working with a customer on the back lot. Those intangibles, Marshall says, allow the typical Dry Ridge customer to take delivery of a new car in about two hours -- well short of the industry average of four to eight hours, according to consulting firm Urban Science. "There's no wizard behind the curtain here," Marshall says. "There are just two ways to stay in business: Expense your way to profit or sell your way to profit." And maybe sell a few homemade apple dumplings, too.